Central Louisiana (Cenla), also known as the Crossroads, is the region of the U.S. state of Louisiana. An ecclesiastical province is one of the basic forms of jurisdiction in Christian Churches with traditional hierarchical structure, including Western Christianity and Eastern Christianity. In general, an ecclesiastical province consists of several dioceses, one of them being the archdiocese, headed by metropolitan bishop or archbishop who has ecclesiastical jurisdiction over all other bishops of the province. Its cathedral episcopal see is St. Francis Xavier Cathedral in Alexandria, Louisiana. It also has a former Cathedral and Minor Basilica: the Basilica of the Immaculate Conception, in Natchitoches, Louisiana. A cathedral is a church that contains the cathedra of a bishop, thus serving as the central church of a diocese, conference, or episcopate. The equivalent word in German for such a church is Dom ; see also Duomo in Italian, Dom(kerk) in Dutch, and cognates in many other European languages. Churches with the function of "cathedral" are usually specific to those Christian denominations with an episcopal hierarchy, such as the Catholic, Anglican, Orthodox, and some Lutheran and Methodist churches. Church buildings embodying the functions of a cathedral first appeared in Italy, Gaul, Spain and North Africa in the 4th century, but cathedrals did not become universal within the Western Catholic Church until the 12th century, by which time they had developed architectural forms, institutional structures and legal identities distinct from parish churches, monastic churches and episcopal residences. Alexandria is the ninth-largest city in the state of Louisiana and is the parish seat of Rapides Parish, Louisiana, United States. It lies on the south bank of the Red River in almost the exact geographic center of the state. It is the principal city of the Alexandria metropolitan area which encompasses all of Rapides and Grant parishes. Its neighboring city is Pineville. In 2010, the population was 47,723, an increase of 3 percent from the 2000 census. It encompasses the civil parishes (Louisiana counties) of Avoyelles, Rapides, Vernon, Natchitoches, Winn, Caldwell, Madison, Franklin, Tensas, Concordia, Cathoula, Lasalle and Grant. The bishopric was established on August 6, 1910 as the Diocese of Alexandria, named after its new see Alexandria, Louisiana, on the territory of the suppressed Diocese of Natchitoches (founded in 1853). The first Bishop of was Augustus Marie Martin. The Roman Catholic Diocese of Natchitoches was a residential episcopal see of the Catholic Church from 1853 to 1910 and is now a titular see. Augustus Marie Martin was a French-born prelate of the Roman Catholic Church. He was the first Bishop of Natchitoches, Louisiana (1853–1875). On October 18, 1976, it was renamed the Diocese of Alexandria-Shreveport. 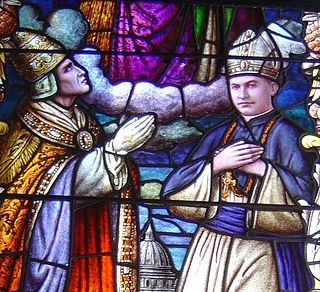 The Roman Catholic Diocese of Shreveport is a Roman Catholic diocese covering the parishes of northern Louisiana, and a suffragan diocese of the Archdiocese of New Orleans. Its bishop is part of the United States Conference of Catholic Bishops and belongs to Conference Region V. Its mother church is the Cathedral of Saint John Berchmans, in Shreveport. Arms was designed and adopted when the diocese was erected. Gules, a cross throughout Argent between four bells of the last; overall, at the center point, a crescent checky Sable and Or. The red background represents the Red River that runs through the See City. The cross, for the Faith, divides the four bells that are taken from the arms of the Ancient Patriarchate of Alexandria, in Egypt, for which the City is named. Overall, at the center of the design is a black and gold (yellow) checky crescent, which is taken from the arms of the Spanish family “Xavier,” and this symbol is used throughout ecclesiastical heraldry as the classic charge for Saint Francis Xavier, titular of the cathedral-church in Alexandria. Holy Savior Menard Central High School is the Roman Catholic parochial secondary institution of learning in Alexandria, the seat of Rapides Parish and the largest city in central Louisiana. The Menard mission statement accents: (1) Faith Development, (2) Academic Excellence, and (3) Service. Menard, operated by the Roman Catholic Diocese of Alexandria in Louisiana, enrolls approximately six hundred students. St. Joseph Elementary and High School, in Plaucheville, Louisiana, is the only Catholic high school within the civil parish of Avoyelles. It is located in the Roman Catholic Diocese of Alexandria in Louisiana. St. Mary's High School is a private coeducational Roman Catholic high school in Natchitoches, Louisiana located in the Diocese of Alexandria. A co-cathedral is a cathedral church which shares the function of being a bishop's seat, or cathedra, with another cathedral, often in another city. Instances of this occurred in England before the Protestant Reformation in the dioceses of 'Bath and Wells,' and of 'Coventry and Lichfield.' These two dioceses were each named for both cities that served as bishop's seats. The Archdiocese of St. Louis is the Roman Catholic archdiocese that covers the City of St. Louis and the Missouri counties of Franklin, Jefferson, Lincoln, Perry, Saint Charles, Saint Francois, Ste. Genevieve, St. Louis, Warren, and Washington. It is the metropolitan see to the suffragan sees of the Diocese of Springfield-Cape Girardeau, the Diocese of Jefferson City, and the Diocese of Kansas City-Saint Joseph. The Roman Catholic Diocese of Yakima is a diocese of the Roman Catholic Church in the central region of the state of the U.S. state of Washington. Headquartered in Yakima, the diocese comprises Benton, Chelan, Douglas, Grant, Kittitas, Klickitat and Yakima Counties. The diocesan cathedral is St. Paul Cathedral, and the diocesan bishop is Joseph J. Tyson. The diocese is a suffragan of the Archdiocese of Seattle, and its metropolitan archbishop is J. Peter Sartain, Archbishop of Seattle. The Roman Catholic Archdiocese of New Orleans,, is an ecclesiastical division of the Roman Catholic Church administered from New Orleans, Louisiana. It is the second-oldest diocese in the present-day United States, having been elevated to the rank of diocese on April 25, 1793, by Pope Pius VI during Spanish colonial rule. Our Lady of Prompt Succor and St. Louis, King of France are the patron saints of the archdiocese and Cathedral Basilica of Saint Louis is its mother church as St. Patrick's Church serves as the Pro-Cathedral of the archdiocese. The Roman Catholic Diocese of Grand Rapids is a diocese of the Roman Catholic Church in western Michigan, in the United States. It comprises 102 churches in 11 counties in West Michigan. It is a suffragan see to the Archdiocese of Detroit. The mother church of the diocese is the Cathedral of Saint Andrew. On April 18, 2013, Pope Francis accepted Bishop Walter A. Hurley's resignation and appointed the Rev. David J. Walkowiak to be the twelfth Bishop of Grand Rapids. The Roman Catholic Archdiocese of Indianapolis is a division of the Roman Catholic Church in the United States. When it was originally erected as the Diocese of Vincennes on May 6, 1834, it encompassed all of Indiana as well as the eastern third of Illinois. It was renamed the Diocese of Indianapolis on March 28, 1898. Bishop Francis Silas Chatard, who had been living in Indianapolis since 1878 when he was appointed Bishop of Vincennes, became the first Bishop of Indianapolis. It was elevated from a diocese to a metropolitan archdiocese on October 21, 1944. The Roman Catholic Diocese of Covington is a Roman Catholic diocese in Northern Kentucky, covering 3,359 square miles (8,700 km2) that includes the city of Covington and the Kentucky counties of Boone, Kenton, Campbell, Gallatin, Carroll, Grant, Owen, Pendleton, Harrison, Bracken, Robertson, Mason, Fleming, and Lewis. Since 2002, the bishop is Roger Joseph Foys. The cathedral church of the diocese is the Cathedral Basilica of the Assumption. John William Shaw was an American clergyman of the Roman Catholic Church. He served as Bishop of San Antonio (1911–18) and Archbishop of New Orleans (1918–34). Ronald Paul Herzog was an American prelate of the Roman Catholic Church, who served as Bishop of Alexandria in central Louisiana from 2005 to 2017. The Most Rev. Napoléon-Joseph Perché (1805-1883) served as the third Archbishop of New Orleans from 1870 to 1883. 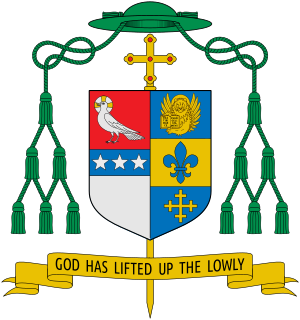 The Roman Catholic Archdiocese of New Orleans is the second-oldest diocese in the present-day United States. Francis August Anthony Joseph Janssens was a Dutch-born prelate of the Roman Catholic Church. He served as Bishop of Natchez (1881–1888) and Archbishop of New Orleans (1888–1897). Cornelius van de Ven served as the Roman Catholic bishop of the Diocese of Alexandria, Louisiana. The Basilica of the Immaculate Conception is a Minor Basilica located in Natchitoches, Louisiana, United States. It is also a parish church in the Diocese of Alexandria. The church building is the seventh structure to house the parish and was at one time the cathedral for the Roman Catholic Diocese of Natchitoches. As the Church of the Immaculate Conception it was listed as contributing property in the Natchitoches Historic District on the National Register of Historic Places. John Mark Spalding, D.D., J.C.L. is an American priest and bishop of the Roman Catholic Church. He is the twelfth bishop of the Diocese of Nashville. 1 2 3 "Diocese of Alexandria, USA". GCatholic. Retrieved 16 April 2019.